This project was created in a partnership with the One Room Challenge Sponsors! Let’s break down this beautiful space shall we? Let me just start by saying that this blush sofa is may be the softest piece of furniture I have ever felt. I’m not even kidding, it is so comfortable. We have been finding ourselves sitting in the entryway just hanging out. My kid’s have been playing on their tablets on it and my husband and I have sat there and chatted about our day. This sofa is seriously amazing! I knew that I was going to need a large piece of art to set the stage for my color scheme in this room. This gorgeous artwork has the most vibrant tones of teal, emerald, navy and blush. I feel like it really ties everything together. 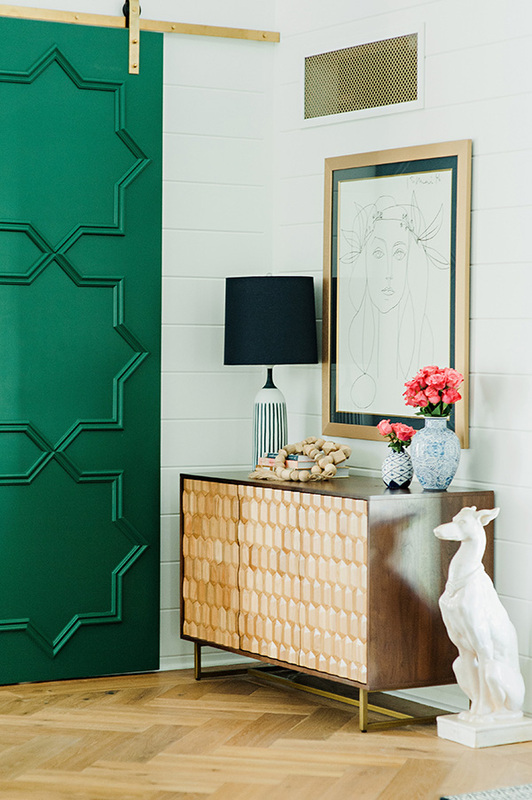 This artwork made the green on my barn doors and my blush sofa make sense together in my room. 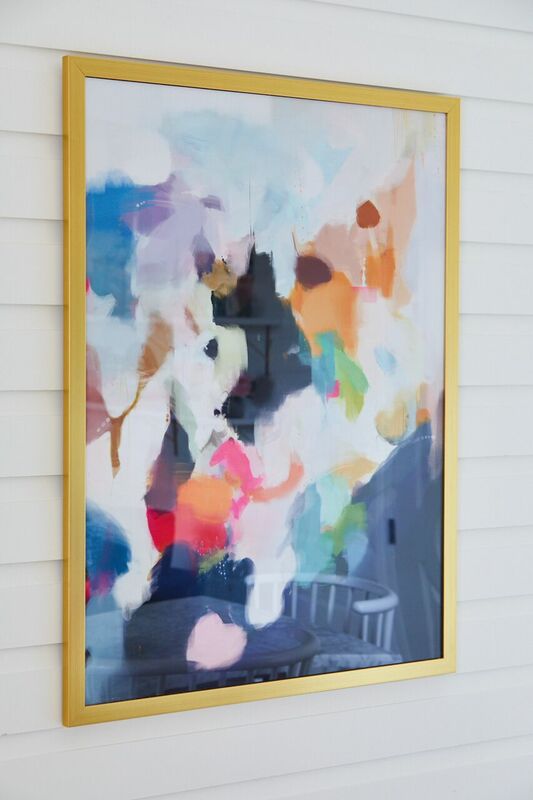 This artwork is 44″ square with a matte brass frame and makes a big statement in the space. The artwork is flanked by these mid century inspired sconces. I love the lines of these sconces and they give off a decent amount of ambient light. They have just the right amount of whimsy that I love in a fine piece of lighting. Let’s not forget about the other side of the room, it is really just as pretty! 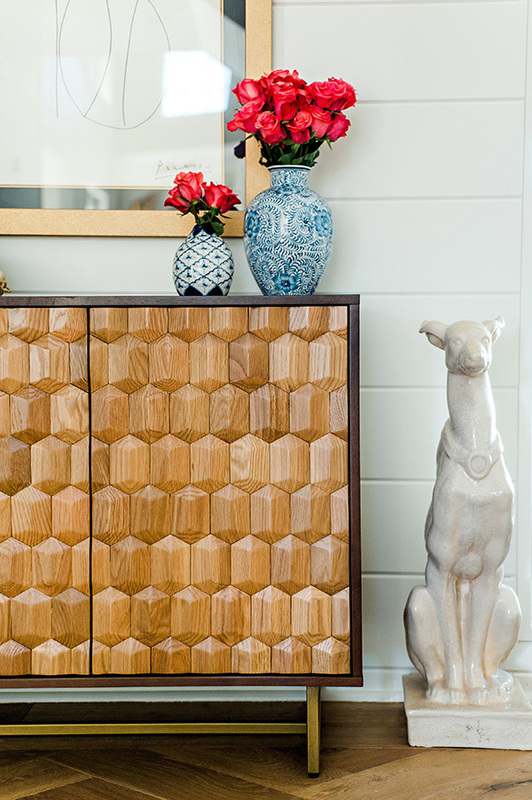 This pretty sideboard from Article is the perfect addition to my home. It provides so much storage and the wood details on the doors are so beautiful. I knew that the tone of the buffet would pull in my flooring and pop so pretty against the green doors we made. Atop the sideboard sits the prettiest lamp from Lamps Plus. My walls in this room are all white v-groove moulding so I wanted something with color that would pop off of the walls. A lamp with a white shade just wouldn’t have been as striking. 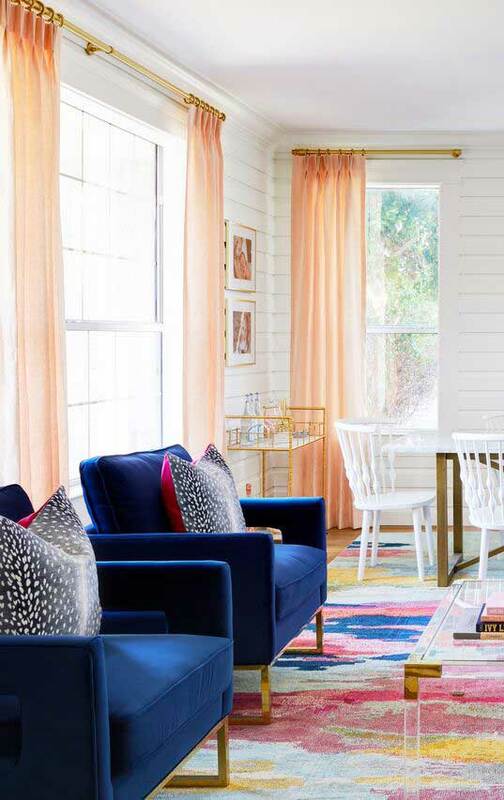 The navy on the shade is a perfect complement to the artwork across the room. 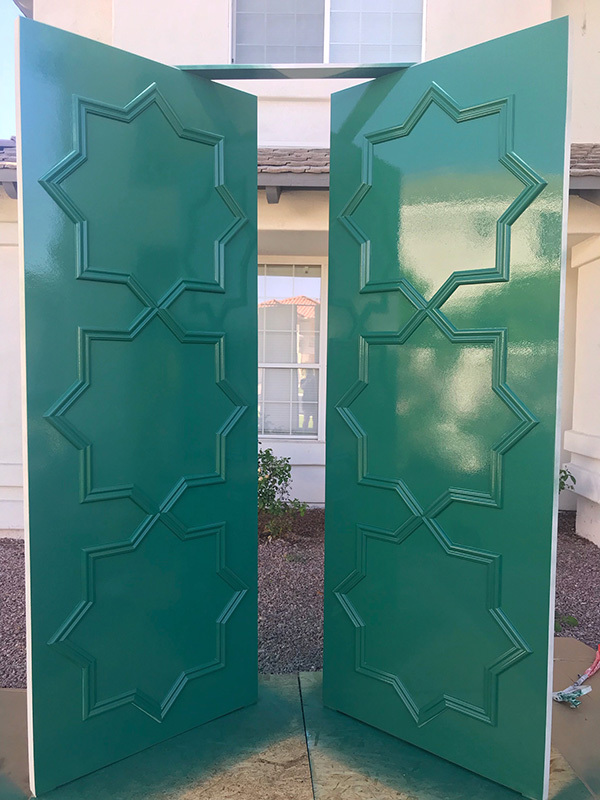 The green doors my husband I made turned out better than I could’ve imagined. I decided to paint them Billiard Green by Dunn Edwards. This was the deeper green I was going for but had that hint of blue I was looking for as well. 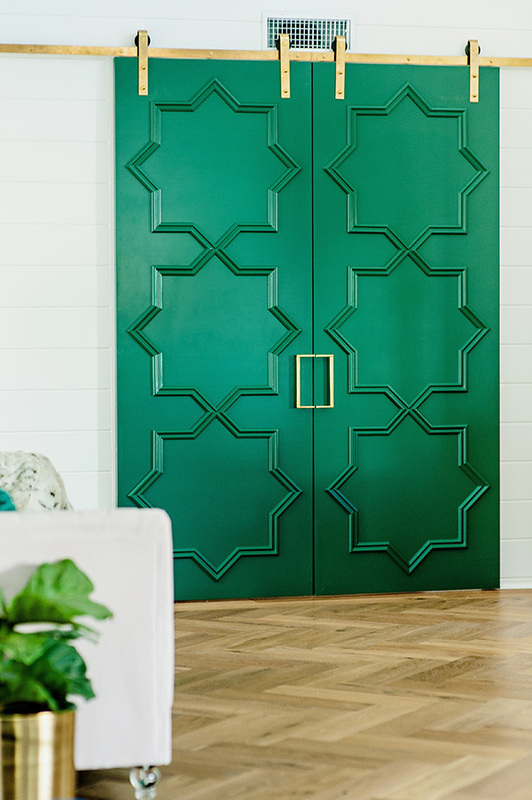 The reason I decided to go with the bold green doors is that I felt like they helped break up all the white of the v-groove moulding a little, oh and I love to take a good design risk! There is one more gem in this room that might be it’s crowning glory. It is very hard to photograph the room with the gorgeous chandelier because it is a 2 story ceiling height. I promise you won’t be disappointed! 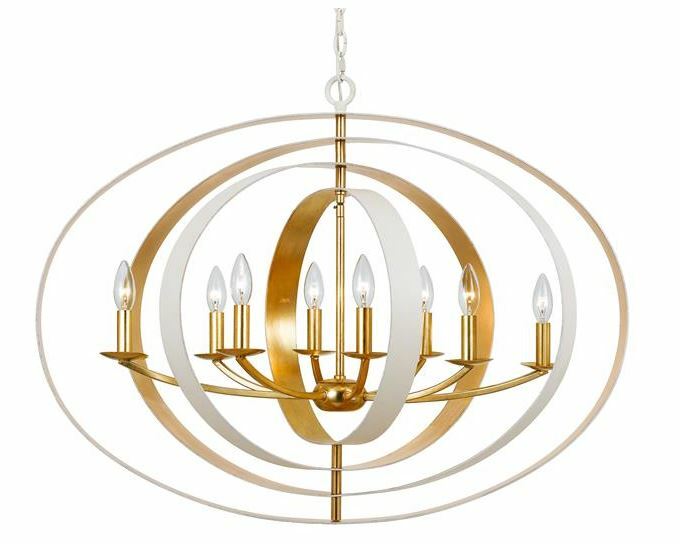 This chandelier from Hudson Valley Lighting makes a big statement in the room at 46″ wide. Once you walk in and look up you are greeted by this beauty and I honestly love it so much. This 2 story ceiling can really take a large chandelier like this, It is even more impressive when you are upstairs and you can look at it eye level, it is a stunner! One of my favorite parts of finishing a project like this is to look back at the design board I created to see it all come full circle. What a satisfying thing to see your vision come to reality and that is why I love what I do. I hope you are inspired to overhaul a room at your house and don’t be afraid to make yourself a design board. Design boards are very easy to make on Powerpoint, you will feel like you have a direction and a plan to execute. Be sure to check out all the reveals of my fellow challengers. Some of them took on some pretty hefty projects this season and some really beautiful designs have been executed. Hey Guys!! Things are getting really real over here in the One Room Challenge! I can’t believe there is just one week left. I would be lying if I didn’t admit that I love the pressure of pulling everything together at the last minute. Maybe it is my personality, or maybe the excitement of pulling it all out just in time. 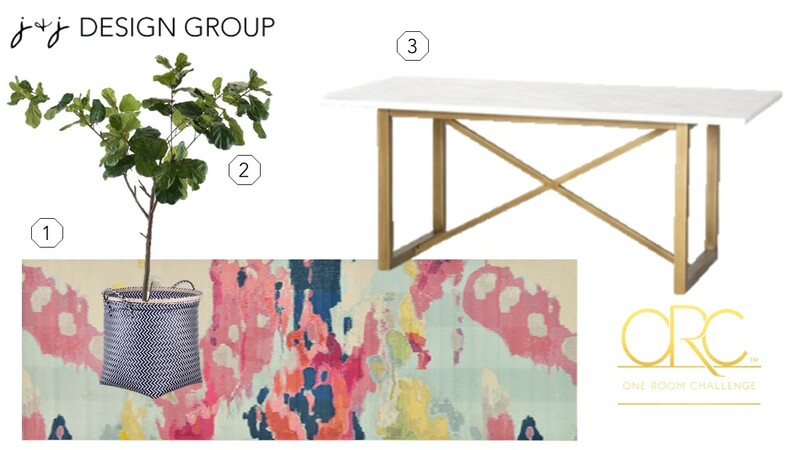 Let me give you a little refresher if you haven’t seen my design board in a while. 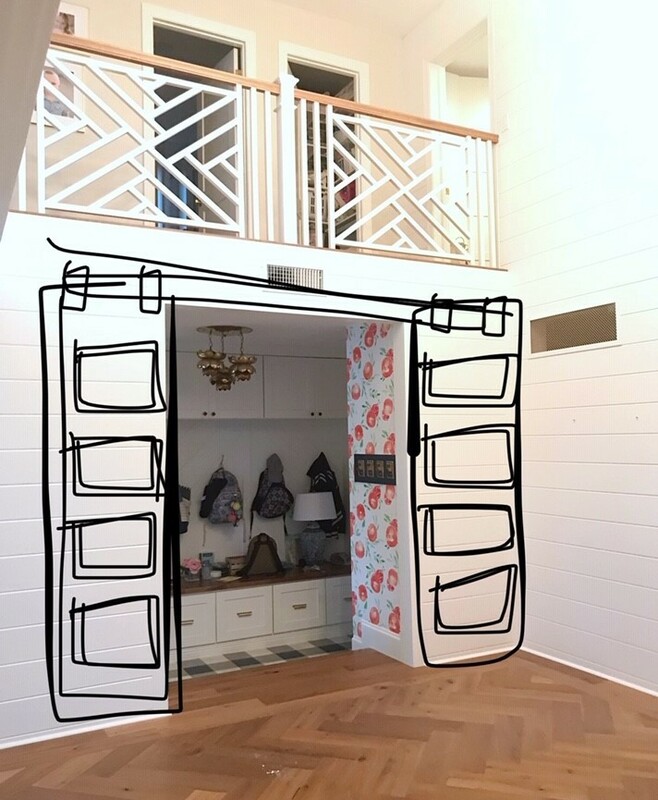 Here is my original plan for my Entryway. There are just a few changes that happened in real life but you might have to wait until my big reveal to see what they are. The biggest feat this week was building the barn doors I decided to do. In my last post, I was debating if I should add barn doors to the room that I could shut over my mudroom. To be honest, I had always envisioned doing the barn doors there. When we bought the house 2 years ago, I had planned to put the barn doors there. 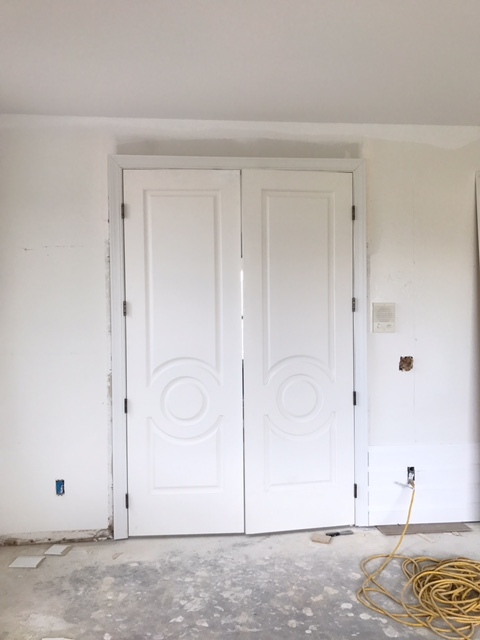 We purchased the hardware, the slab doors and even planned where the thermostat would go in advance so we could add them later. We were so overwhelmed by all the house projects that the barn doors were put at the bottom of our list. 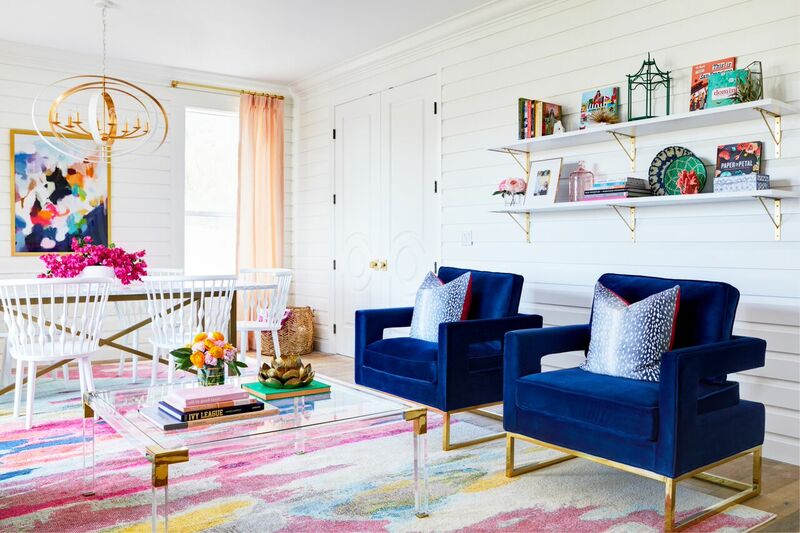 I had no idea what color I wanted them to be or even the design I wanted but that is what I love about the One Room Challenge! It forces me to just make some decisions and go with my gut when I would have just put it off. It is so easy for me to make decisions for my clients,but when it comes to my house sometimes I am at a loss. I guess maybe I just overthink it too much, so here I am now, making some solid decisions! Let’s chat a bit about the doors we made. In my last post I shared the design I decided to do. I was searching the internet and found some inspiration. I drew the doors up in Auto CAD, found the angles, and put my husband Dave to work on getting all the moulding cut for our new doors. He numbered each piece so we knew where each piece went. It was quite a few cuts and could get very confusing if we didn’t keep them organized. Once we laid out each door, we nailed down all the pieces with a pin nailer. I have a battery operated one and I love it so much. It is so great for little projects like this. After we nailed all the pieces on, filled the joints an caulked the edges we were ready for paint. I am so in love with the design of the doors. I love how you can be inspired by something and then make it a reality. This is the best part of designing something. When inspiration becomes a reality. 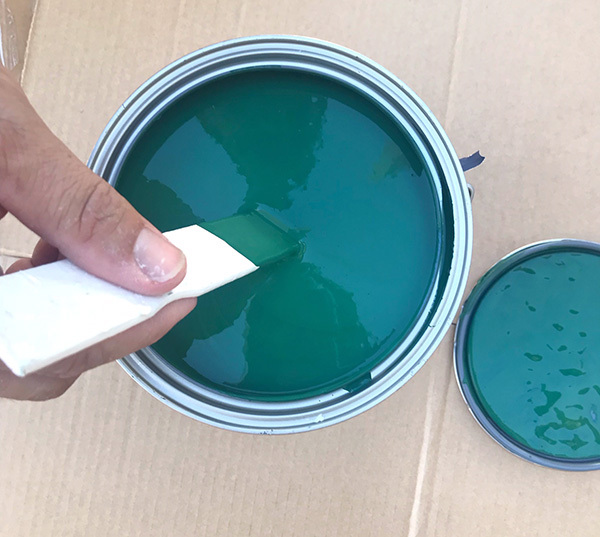 The next most important step was selecting the paint color. I have to admit, I was a little nervous about getting the perfect shade that I had in my head. I decided to go with Dunn Edwards: Billiard Table DEA178. Isn’t it so pretty?? It has just the right hint of blue in it to bring the whole room together. So….. Do you want to see the doors painted? My husband painted them with his airless paint sprayer. I decided to go with a semi-gloss finish because I wanted it to have just a little shine. I honestly cannot wait to see them hung with the satin gold hardware! That is all I got for this week friends! Are you so excited for the final reveal next week? I know I am!! I can’t wait to show you how everything has come together. 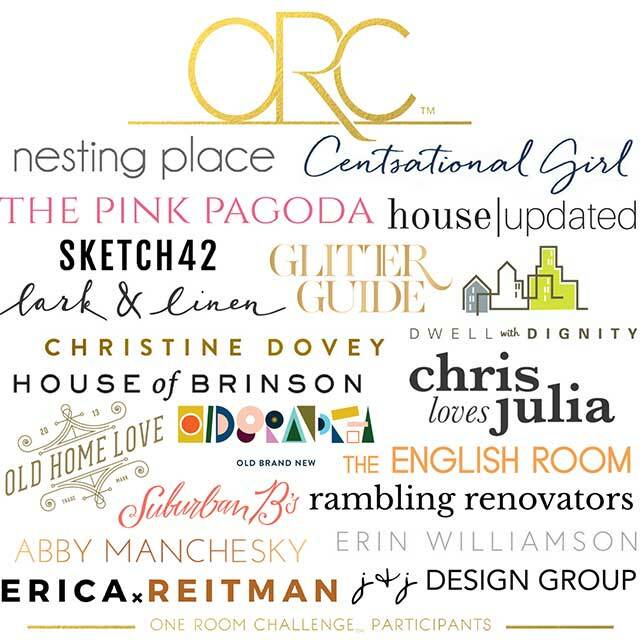 Make sure to check out all the amazing design that all my friends participating in the One Room Challenge are working on as well. There is so much good design happening!! Hello Friends!! Another week has passed us by and we are another week into the One Room Challenge. I would be lying if I told you I am not feeling the big reveal approaching. I have been going back and forth since my last post on if I should add barn doors or not. Honestly, I feel like the space is lacking just one more architectural element. 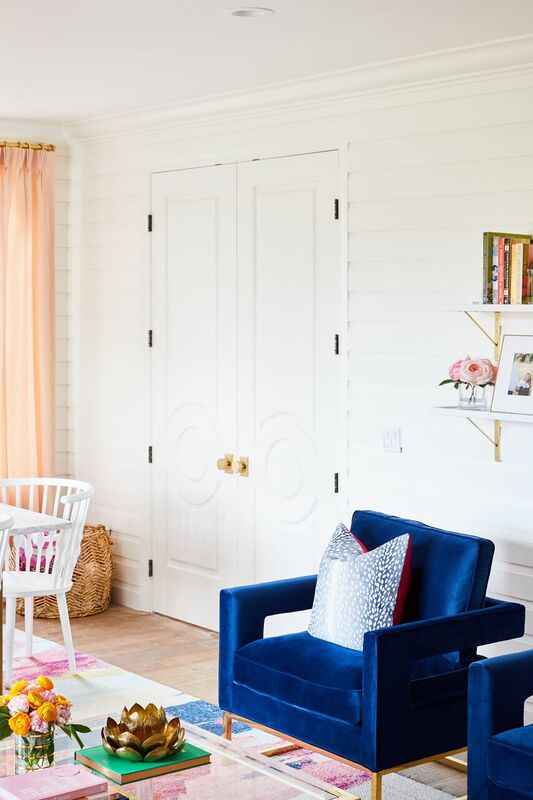 I had always envisioned adding barn doors to the room so it almost felt wrong not to do it. The side board I received from Article is so gorgeous, but you will have to wait for the final reveal to see it of course. I mean, it’s more fun that way right? Ok, I will show you a picture of it just to jog your memory! This piece is so close in color to my flooring that I thought if I added the barn doors in a pretty dark green that it would pop that much more and shine like the diamond that it is. 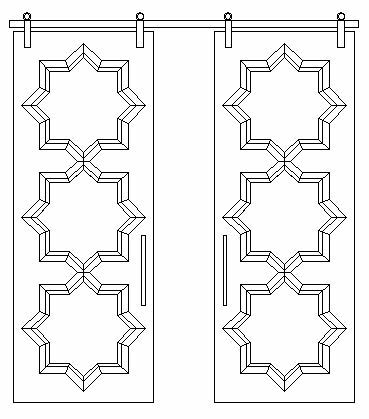 I was scouring Pinterest like many of us do, and I came across this door design that I saw on Coco Cozy’s blog. 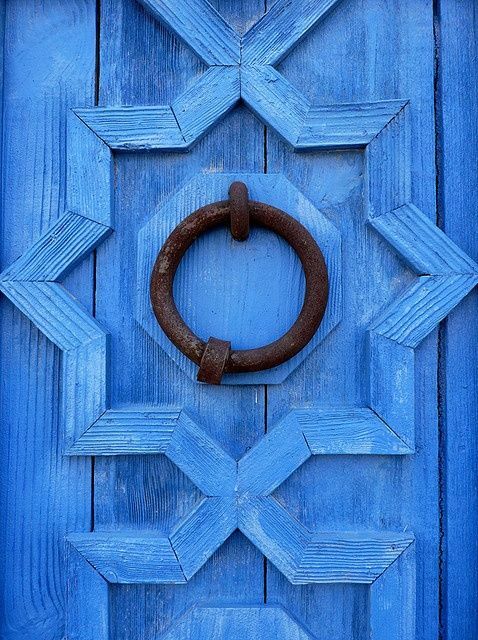 I am not sure if this is a door she saw while traveling but the design hit me like a Mack truck and I fell in love. Here is the photo she had posted to her blog. This isn’t quite the color I am thinking but this is definitely the design I am planning to go with. I will be using a moulding that isn’t so flat but has a little more detail. Here is what I drew up in Auto Cad so I could give my husband an idea of exactly the look that I am going for. 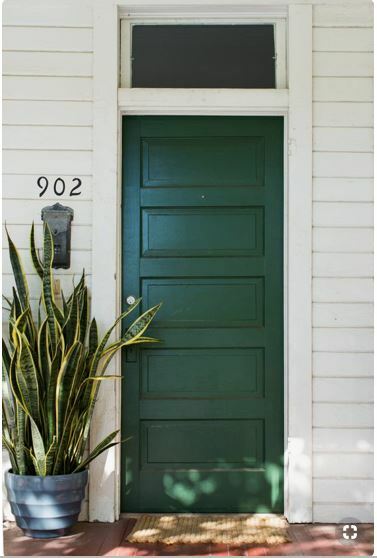 I really want to paint the doors a darker green color. I plan on using satin brass hardware for the door pulls as well as the track system. 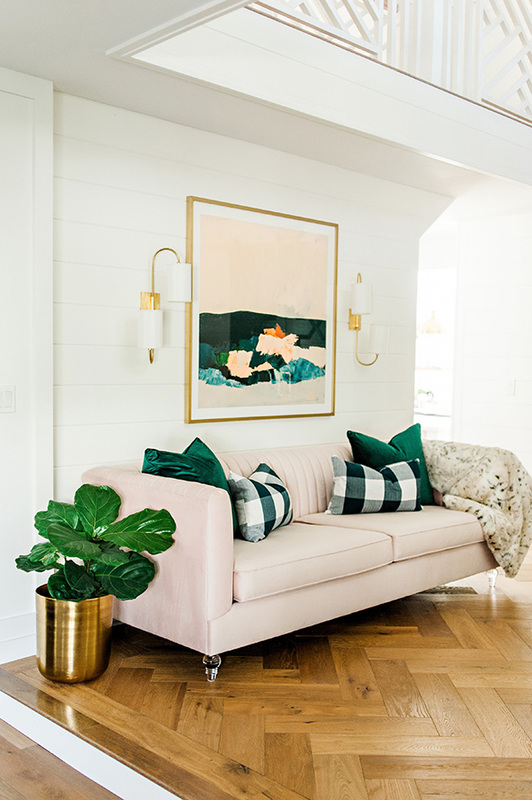 I want to pull the green from the painting from Minted that is hung above the sofa. I haven’t selected the exact color yet, but stay tuned…. It will be revealed in the next post. Do you have a favorite moody green you would like to share? Please do tell!!! Here are a few inspiration photos I found on Pinterest. 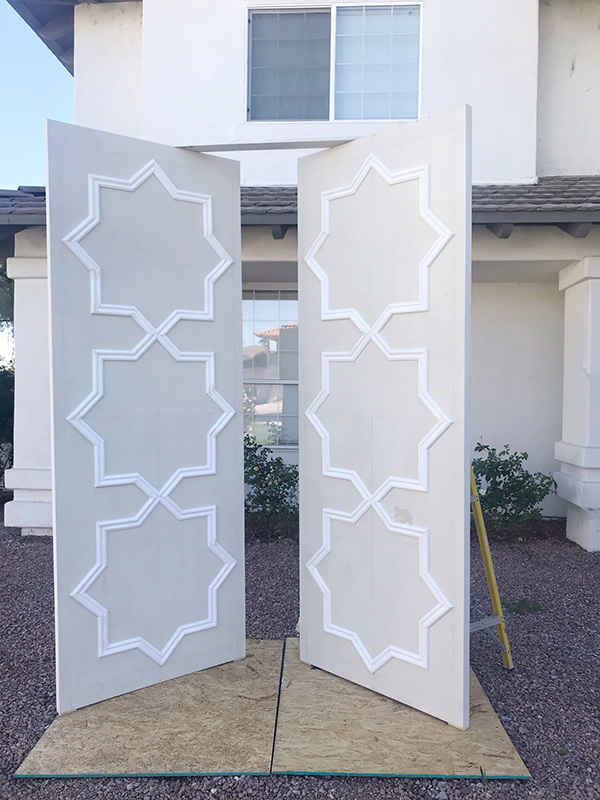 Stay tuned for our journey on making these barn doors. Think chic barn doors, no cows or chickens coming out of these doors. Architectural details always take the room to the next level, I hope my hunch is right on this one. Until next week friends. Be sure to follow my fellow challengers to see all the exciting things happening in their rooms. I promise you will be inspired! This week has seriously been so fun! The sofa I ordered from Hayneedle came, my Article sideboard came and since the big pieces are getting here it is really becoming real! Sometimes it is so much harder to design for yourself rather than your clients. It can be so hard to decide what look I want to go for and run with it. No overthinking!!!! 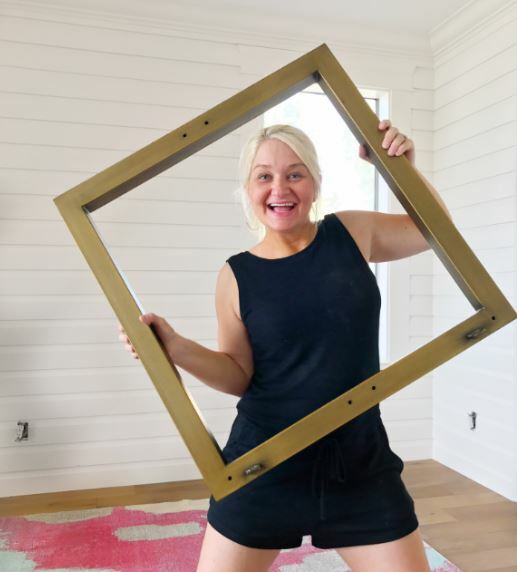 Let’s chat a little bit about why I selected the pieces that I did for my entryway for the One Room Challenge. 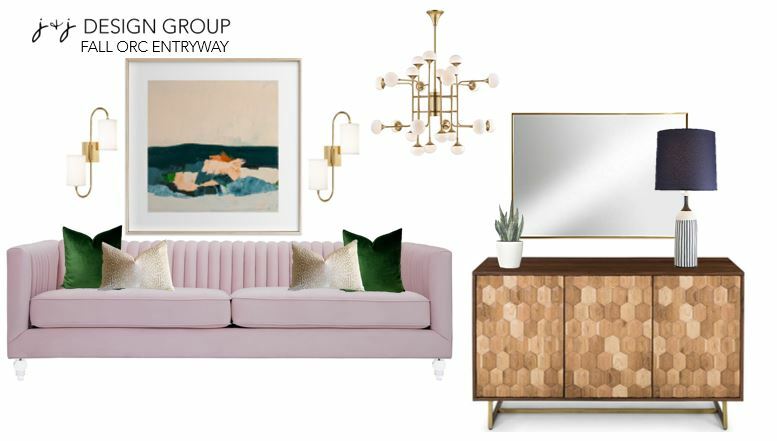 Sofa: I have been crushing over this blush sofa for a long time now. The color is perfect, the fabric is soft and the channel tufting is so on trend. I am not afraid to have a pink sofa be the first thing you see when you walk in my entry. It says “Hi, I’m fashion forward and I am not afraid of a little color! Artwork: The artwork that I selected from Minted is what I like to call the “lead of the room” . When I refer to a “lead” this means that this is the piece that brings the whole color palette together. I selected this particular piece because I loved the navy, deep green and blush tones in the abstract print. I love to add a little brass accent so the brushed gold frame was the perfect accent. Sideboard: This sideboard from Article really spoke to me because I am currently obsessed with Walnut wood tones. I feel that walnut is so timeless and is such a great accent to any room. 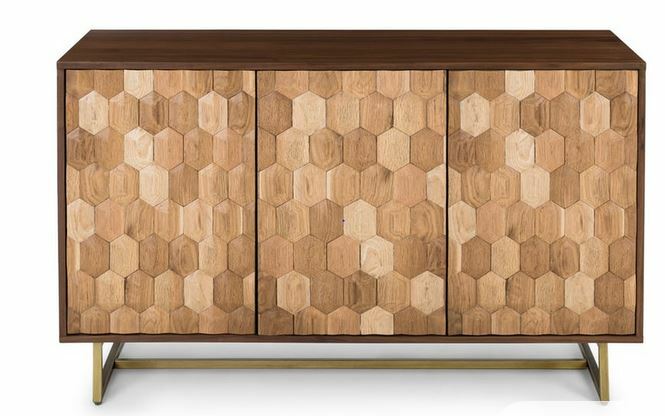 The beveled hexagon panels on the front of the piece are so beautiful. I was so impressed with the quality of this piece. 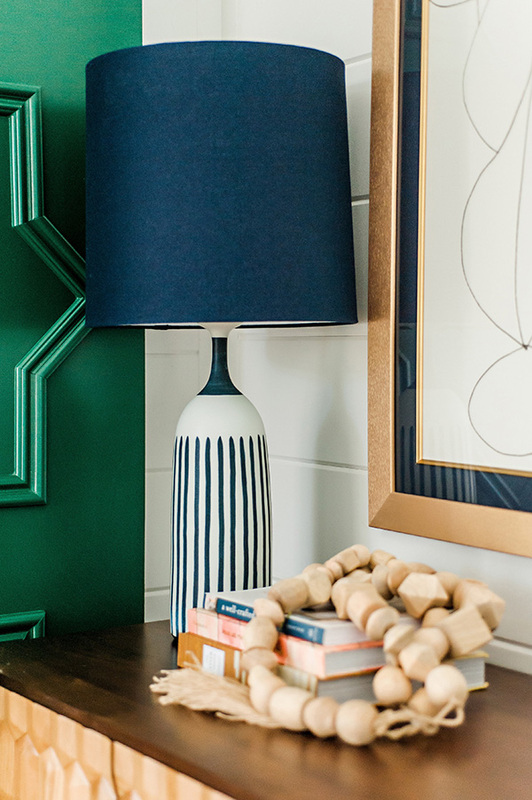 Lamp: Since I decided to do a v-groove moulding on all the walls in my entry, I knew I needed a lamp that would really pop. The lamp I selected from Lamps Plus is so gorgeous! 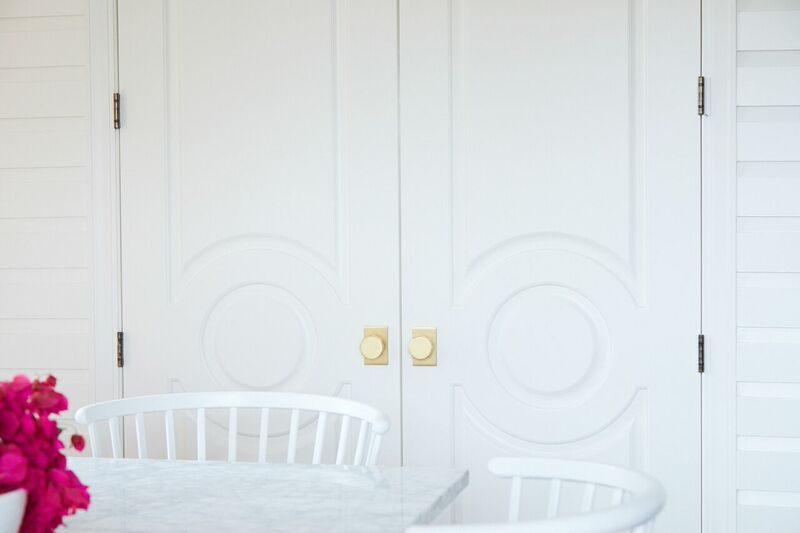 The navy shade pops so pretty off of the white moulding walls and is such a great compliment to the sideboard. The quality of the lamp is great too, it is heavy and substantial. I still have a few things that I am contemplating for the room. Do I do a rug to ground the space but cover my gorgeous herringbone wood flooring? Should I add barn doors to the entry to my mudroom and paint them a gorgeous dark green? What pillows should I do on this sofa, some sort of animal print? I have all these things that are running through my head that I just can’t decide on. What do you think? 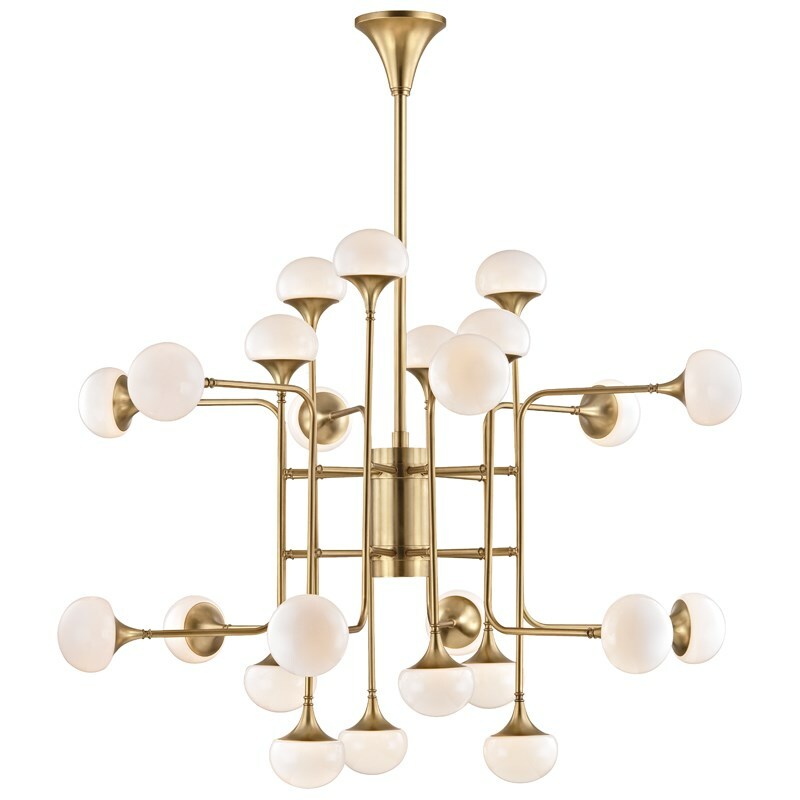 I really had my heart set on the chandelier in my original design board, but like a lot of items in the interior design industry, it wasn’t going to get here for my ORC deadline. I still feel like you need to know all about it and order it for your house. 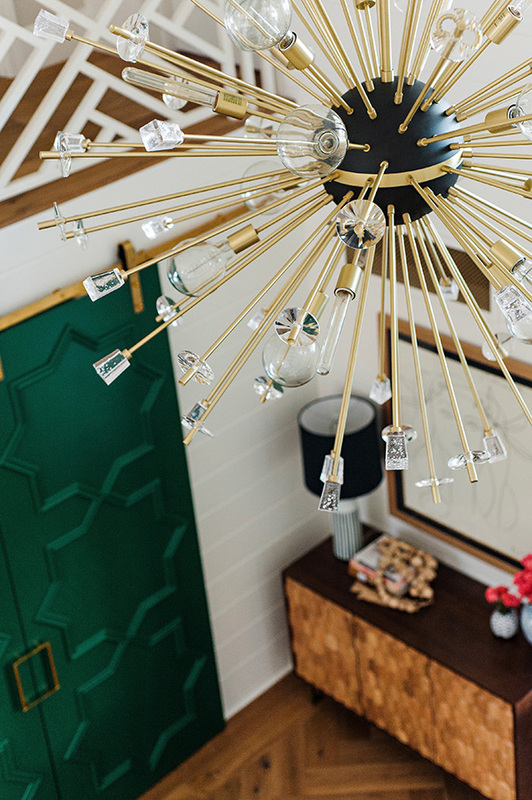 Here is the chandelier that I had my heart set on for my entryway. I love the vintage vibe it has and well it is gold so that is a plus in my book. Since I am not able to get this fixture in time to finish my ORC challenge I had to go to plan B, which is also such an amazing fixture so it is a win win situation for me. Here is the fixture that I selected as a replacement for my original selection. Here are a few pics of what the room is looking like so far. 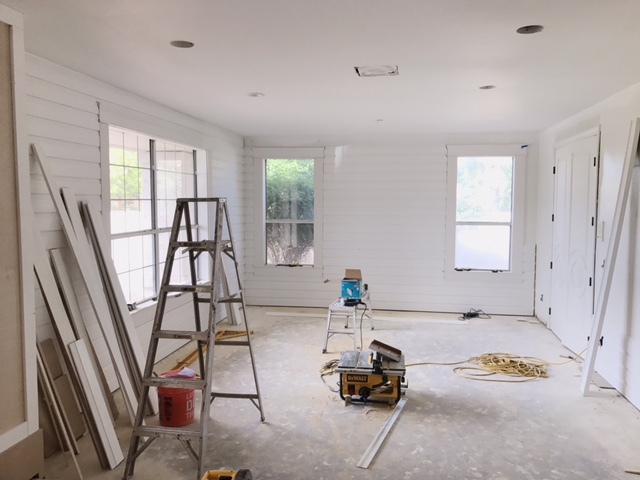 It is pretty much blank slate at this point and I can’t wait to pop in all the color with the furniture and artwork. I decided to draw in where I was planning to put my new pieces so you could see it come together before the big reveal! This is the very first wall you see when you walk into my front door. 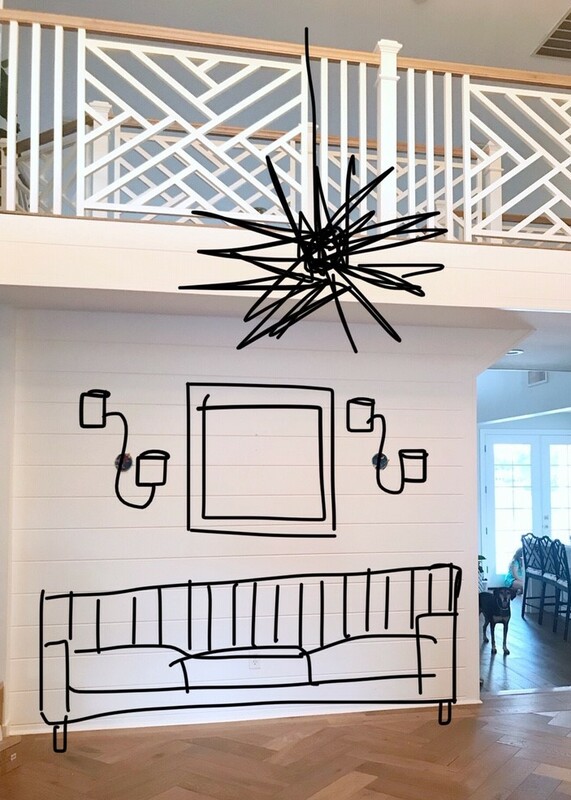 I wanted the sofa to be a centerpiece and accented with a dramatic piece of art and some really great sconces. The sconces I chose are also from Hudson Valley Lighting. They have so many beautiful selections, they are definitely worth checking out! The opposite wall with the door is where my pretty sideboard from Article will be as well as the amazing lamp I found at Lamps Plus. Here is what I am thinking it will look a little bit like once I get it installed. 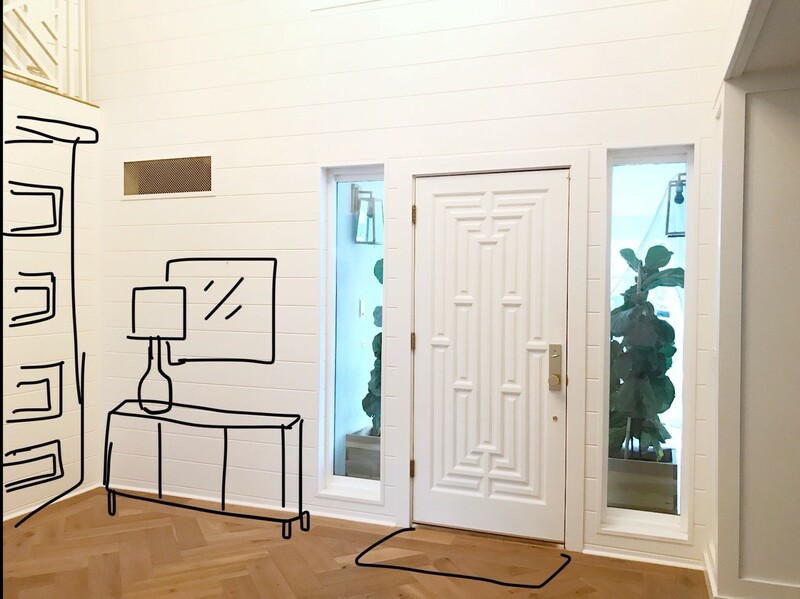 Here is the big question that keeps me up at night…….. To add barn doors or not to add barn doors over the opening to the mudroom. Please weigh in and tell me what you think I should do. I need your help, I really just cannot decide. If I do decide to do them, this is what I was thinking I would do. Ok friends, let me know what you think I should do!! 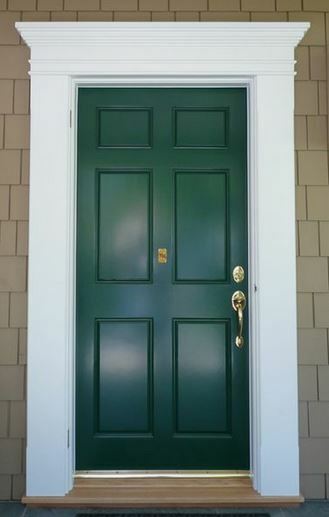 I was thinking dark green for the doors with a gold hardware for the handles and sliding components. Week two of the one room challenge is good stuff friends!! Some of my items are starting to arrive and it is like Christmas everyday… eeeep!!! 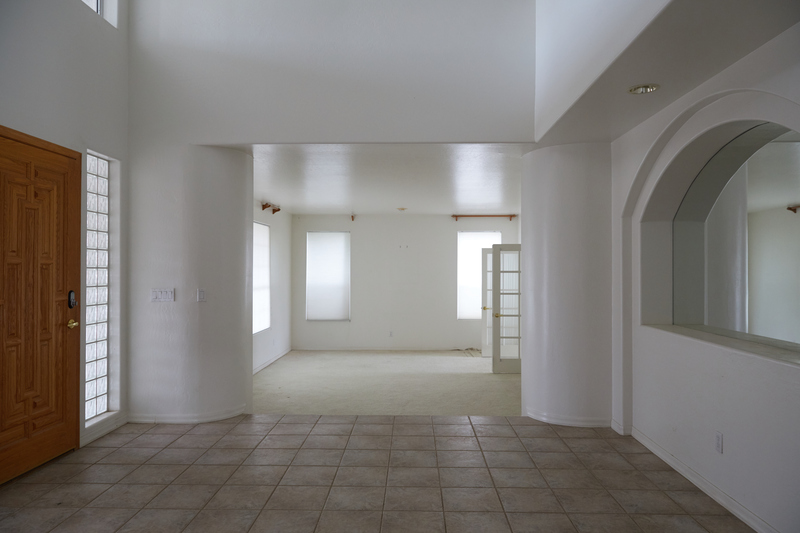 In my last post I showed you pics of what the room looked like when we bought the house. We have been living here for a little over a year now and I had made some improvements in the meantime. 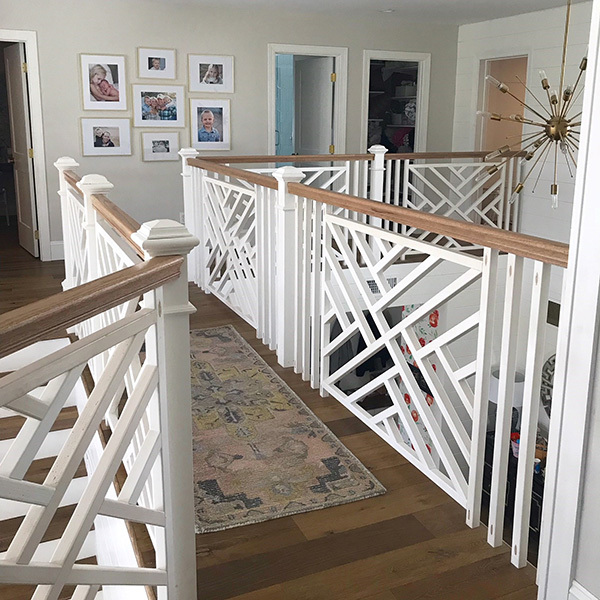 We added a v-groove shiplap to the walls, herringbone wood flooring and we redid our banister with a Chippendale design. Here are a couple progress pics so you can get an idea. I had my star railing custom built to my specifications in this chippendale pattern. When you enter our home an look up, this is the first thing you see. I really love how it turned out! Ok, so let’s get down to the nitty gritty, here is the design board that I came up with for the room. I still have a few extra details that I am working on that I will reveal later. I am working out the details to see if I can do them. I hope you are excited because I know I sure am!! Check back next week for some design tips and also I will dig in a little deeper about why I selected these pieces and where I will put them. Make sure to follow along with all my other challengers to see what fun stuff they are cooking up this season! 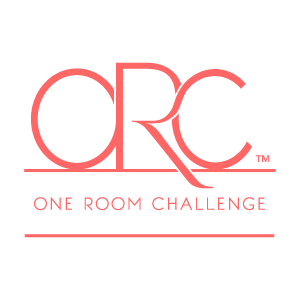 I am so honored to be a part of the One Room Challenge this fall. Last time I took part in the challenge I completely remodeled my Living Room/ Dining Room area. I have to say, it is my most favorite room in the house! Just to jog your memory, here it is! Needless to say I absolutely love color and since this is my house, there will plenty of it to go around. This challenge, I decided to redo my entryway off of this room. 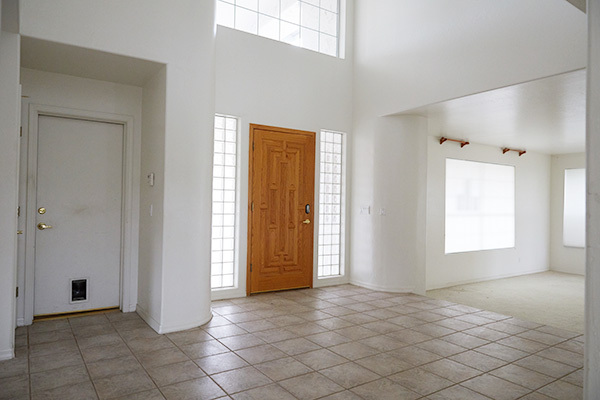 It really just doesn’t compare and since you can see them at the same time, the entryway definitely could use a little love. 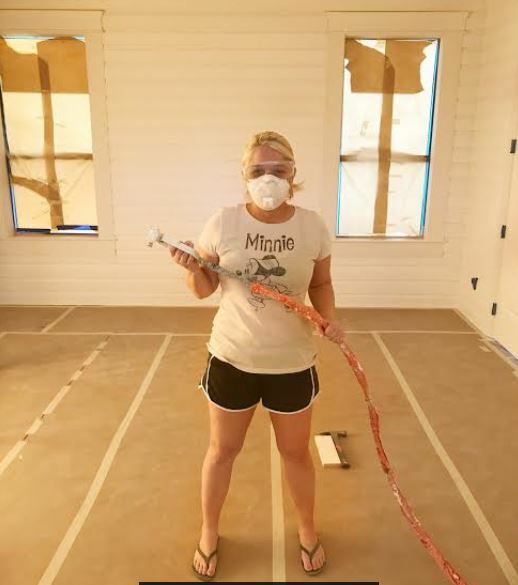 When we purchased the house, every room had to be gutted and redone. The architecture was dated, the finishes were dated and obviously the floor was dated. Here is what we had to work with when we first moved in about a year ago. Ah, yes, just look at that arched mirror on the left. I am pretty sure this is not what our guests want to see as they enter my home. There are too many things going wrong here, I just had to start from scratch LOL! The room to the right is my Living Room/ Dining Room the room pictured above from my first ORC. Obviously these pictures are older but I wanted you to see a true before of how far this room will come by the end of the challenge. 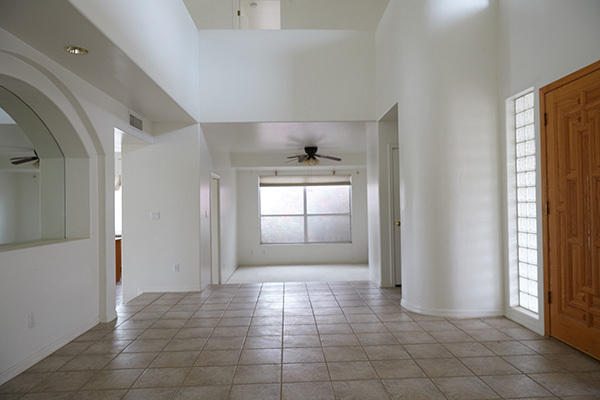 What could I possibly do with this terrible space?? What on earth have I gotten myself into? Well, I guess you will just have to follow along to find out! I promise you will not be disappointed. Please make sure to follow along with all my fellow challengers to see all the good design that is to come from this fun challenge! OK folks, the moment you have all been waiting for…….. THE BIG REVEAL!!! Here she is in all her glory, my new Living Room/Dining Room!!!! This is everything I LOVE. She boasts a gorgeous mill work backdrop, pops of color and a touch of gold! What makes this room so beautiful you ask? This is the marriage of all of these beautiful pieces that make this look really come together. Let me break it down for you piece by piece. Lets start with the Mill work shall we? Let us not forget about the gorgeous doors and hardware. I found the door hardware from Emtek and completely fell in love. I actually ended up purchasing these knobs for my whole house. Emtek is one of the only brands that I have found that has perfected the satin brass finish. I love the octagonal detail on the knob and the reason I love it on the doors, is that it adds another linear element to the circular detail on the door. I chose my color palette around this beautiful Rug I found at All Modern. 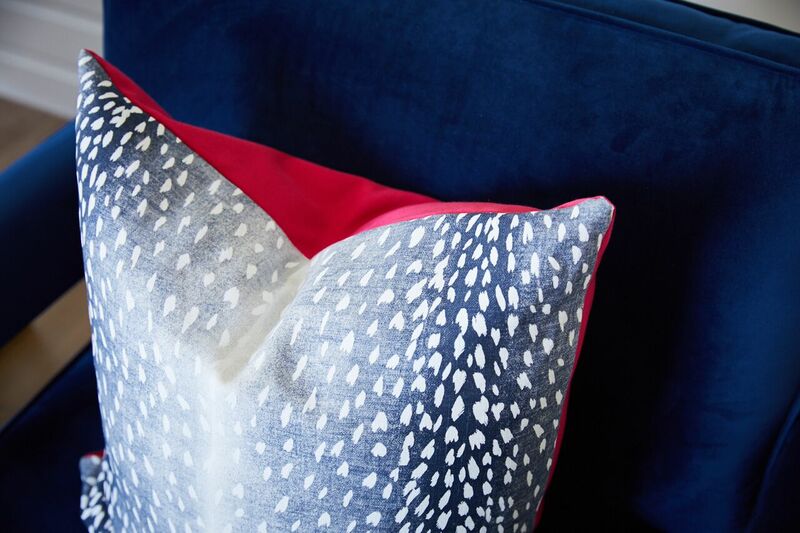 I love to use navy as my base color in a scheme and pop in bright fun colors. This particular rug hit all of those points for me. Another thing that sold me on the rug was the size of it. It comes in a 16’x 10’6″ size which fit my room perfectly and married my two spaces together although they have separate functions, Living and Dining. Now that I have my base set, let us move on to the furniture. 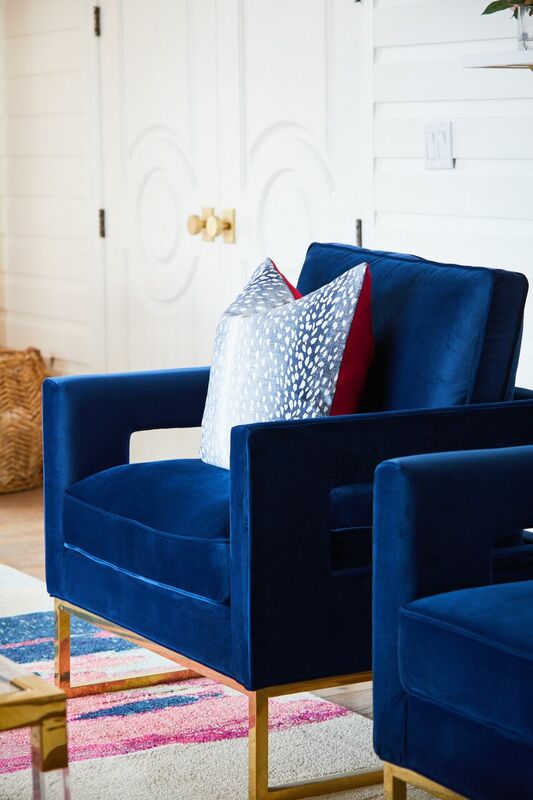 I have been crushing on these navy chairs from All Modern for at least a year now. When I found out that I was able to use them in my one room challenge I was ecstatic. I can just see my husband and I sitting here with a couple friends drinking cocktails and discussing our busy lives. Well, maybe once I finish the rest of my house! These chairs aren’t only comfortable but so soft to the touch. The perfect touch to round out these chairs are the custom pillows I made with a couple Fabricut fabrics that I selected. On the front of the pillow I used this antelope fabric from their Vern Yip collection. I think adding a animal print to your space is always a good idea! I decided to add a bright pink to the back so it would have an extra “pop” peeking out from the back. I finished it off with a gold zipper. Between my 4 chairs, I chose this gorgeous Lucite cocktail table from Lamps Plus. The reason I chose this table is that I wanted the table to read through and make the room feel more open. 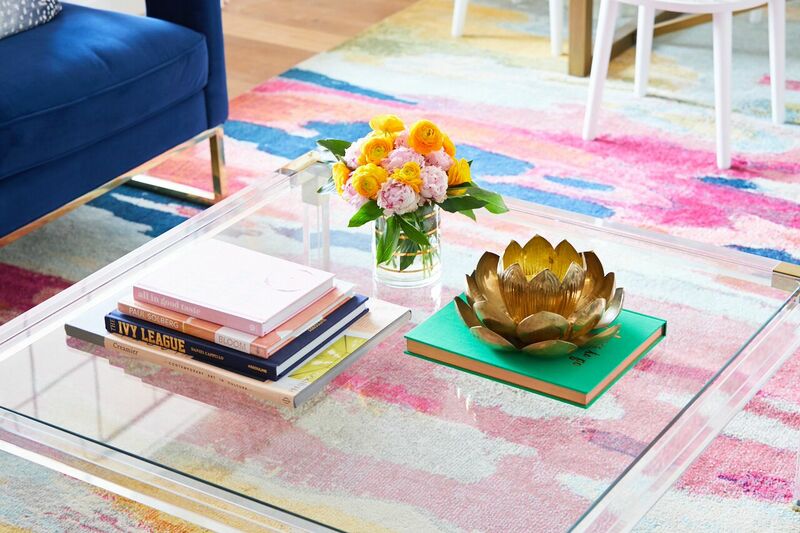 This cocktail table has the prettiest gold details that make it feel elegant. Because it has a glass top, you are still able to see my beautiful rug. Moving on to the dining area. This is where I will definitely be hosting this year’s turkey dinner! I found the dining table at The Mine and it fit perfectly into my criteria; Marble top, brass base and seats at least 6. The reason I love this table is that it is such a timeless piece. 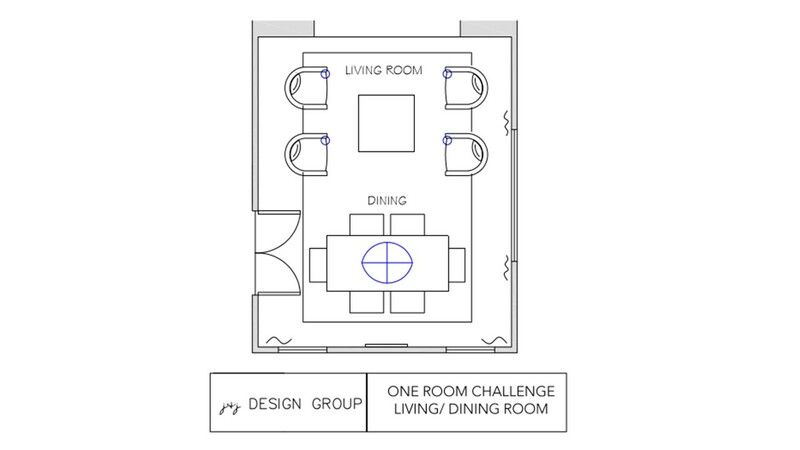 I wanted to find a dining table that I could not only host dinner parties but have a little extra room to spread out if I am working on a large project. I must address the dining chairs because I know I will probably get questions on them. Here is their story! My friend found them for sale on Facebook. We drove down to a liquidation warehouse in Phoenix and scored them. I am not exactly sure where they came from but I like to think they are good Karma! 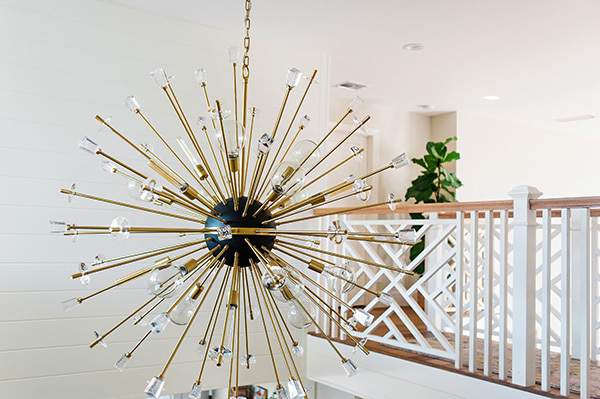 I wanted to bring the eye up with this gorgeous light fixture I found from Crystorama. This is from their Luna collection and is the perfect size for above my table. It has the most beautiful gold finish on the inside and white finish on the outside. When you move around the room the look of it changes and adds so much interest. Do you see the pretty artwork peeking through my light fixture? It is an amazing piece from Parima Studio. The reason I fell in love with it is the composition of all of the beautiful colors. I am always attracted to abstract artwork and had a hard time deciding on which one of her pieces I loved more. 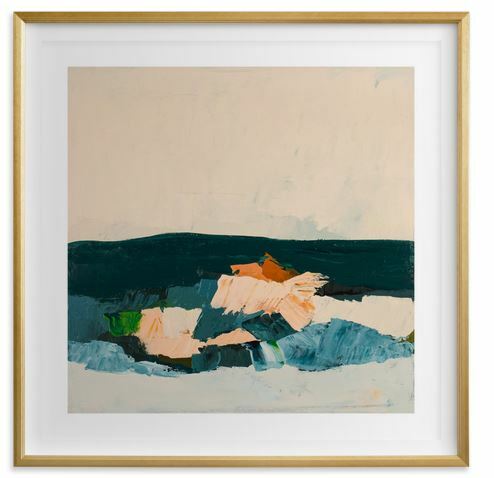 The piece was beautifully framed by FrameBridge in a simple gold frame. 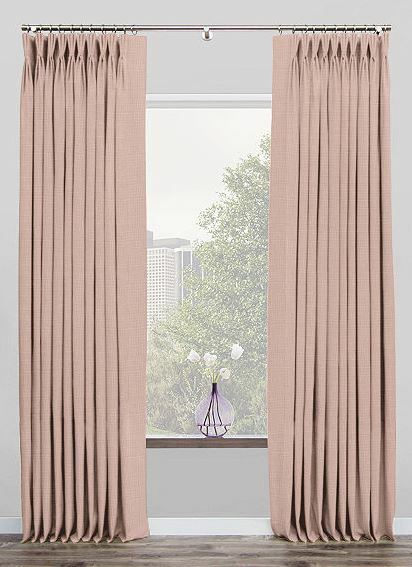 To soften the windows I added this beautiful drapery from The Shade Store. I selected the pinch pleat drapery panels in their Linen Cameo. Their satin brass curtain rods were the perfect match to my door handles, and chandelier. 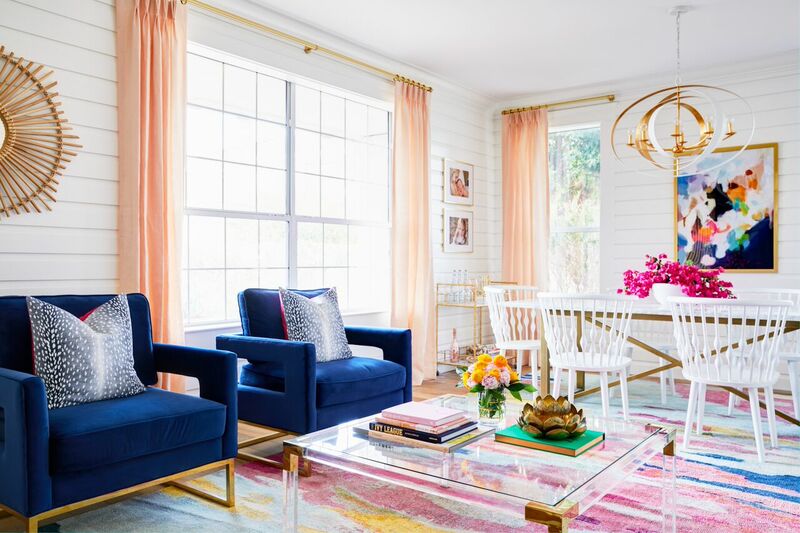 The drapes bring your eye up and add a soft pop of color to the architectural details on the walls and windows. Oftentimes, a room can feel naked to me without the softness of window treatments. Not only do they provide privacy but they also provide another opportunity to add a great design detail to your room. I think one of the hardest decisions for me was what to do with the wall to the right. I looked for art but I didn’t want to select something that was going to compete with my Parima Studio Artwork so I decided to do shelves. I wanted to display my collection of design books and a few fun accessories I had been collecting over the past few months. When I am out shopping for clients, I will pick up little things that I like and hid them away for an occasion such as this. 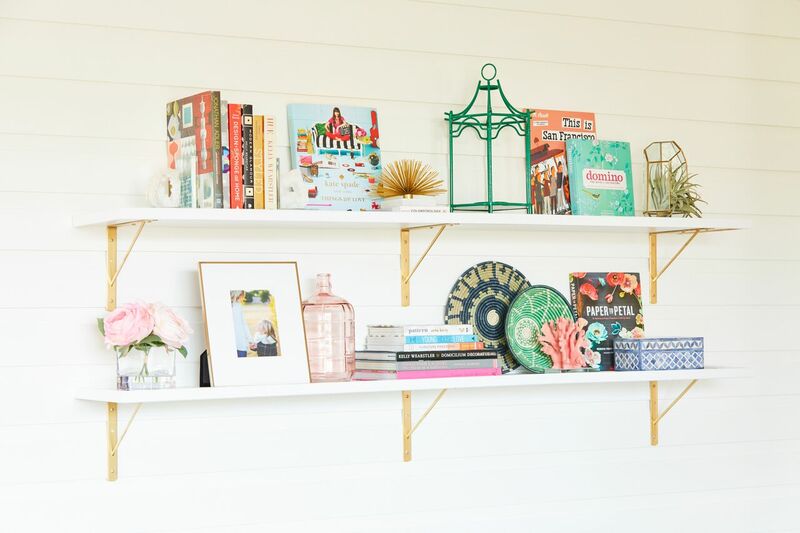 Here is the cute little styled shelf that I came up with. They are actually just shelves and brackets that I found at Home Depot. The brackets were white and I spray painted them gold to go with my overall look. Most of the accessories I found while shopping at HomeGoods. I decided to add in my bar cart in the corner of the room next to my dining table. This will be a handy little landing spot for a dinner party. I found this one at HomeGoods in the clearance section since the glass was a little chipped on one of the corners. I am so very happy with the way my space turned out! I would love to thank Linda from Calling it Home for inviting me to join in on the fun this challenge as well as the wonderful vendors whom sponsored this room. I am truly grateful to call this room mine and the many memories to be made here by my family and friends. Make sure to check out the reveals of all my fellow challengers! All ideas and opinions are my own! Once all of the prep work was finished, we were ready to paint, and boy was I ready to paint. I mean, READY, READY! Let’s get this show on the road! Isn’t painting so satisfying? It is such a quick change in such a short period of time. 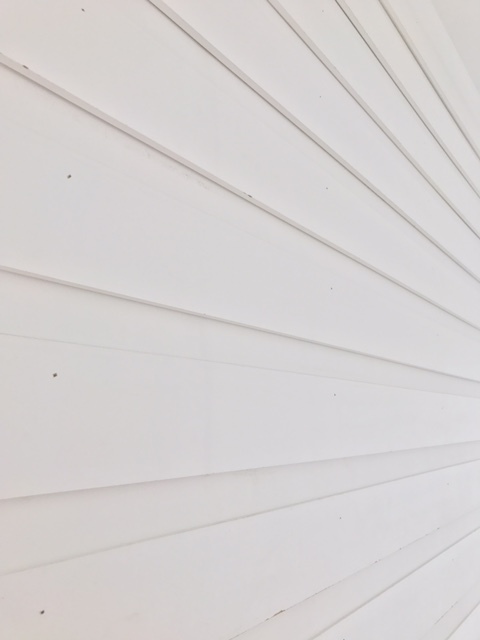 I decided to paint my walls the same color I am doing on the moulding in the rest of my home, Dunn Edwards: Whisper. This is a nice soft white without too much yellow or blue undertone. I love once everything is freshly painted and it is time to rip off the tape, this is also very satisfying for me. Maybe I am a little strange, but I love it! Just look how pretty everything is once we got it all painted. It is even more gorgeous in person, I promise! 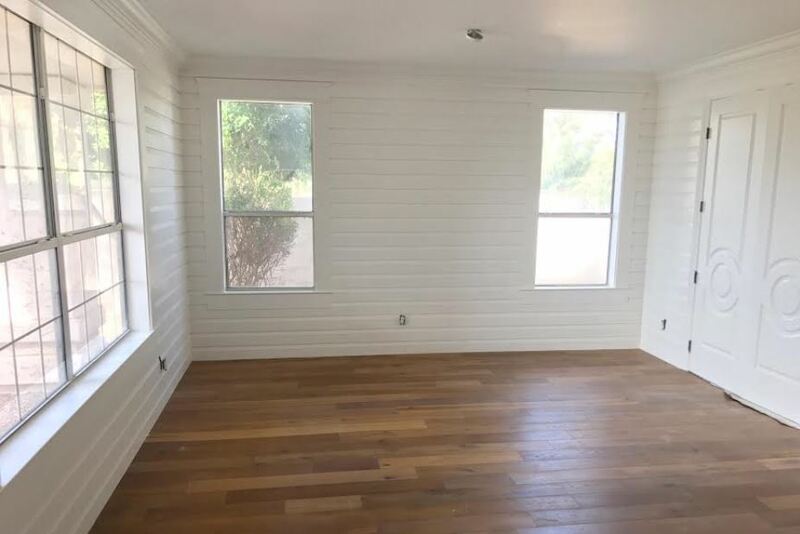 What does one do with a pretty room like this? Well, start adding in all the pretty furniture of course! This is my most favorite part (aside from building the furniture). Seeing all the finishing touches going in makes it worth all the hard work. Here I am with a piece of my dining table from The Mine that I am starting to put together! It was actually pretty easy. About ten bolts and it was all together. Gosh, it is so hard, I want to show you more but there is still so much to be done. I will leave you with this little snippet of what I have done so far. 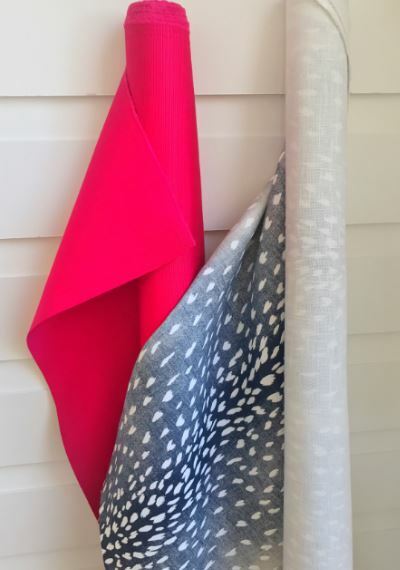 Don’t forget to come back next week for the final reveal and all the details on each piece and why I chose each one. This rug from All Modern couldn’t be anymore perfect for my space! It has all the colors I love, fits my room perfectly and it is very soft under your feet. I am completely obsessed with it and I highly recommend it! It is a match made in heaven with my dining table! P.S. My pillow fabric from Fabricut came in too!! This week is shaping up to be pretty much more of what we were doing last week. Mill work, millwork and more millwork!! I have to say I am pretty obsessed with the way this wall treatment is turning out. 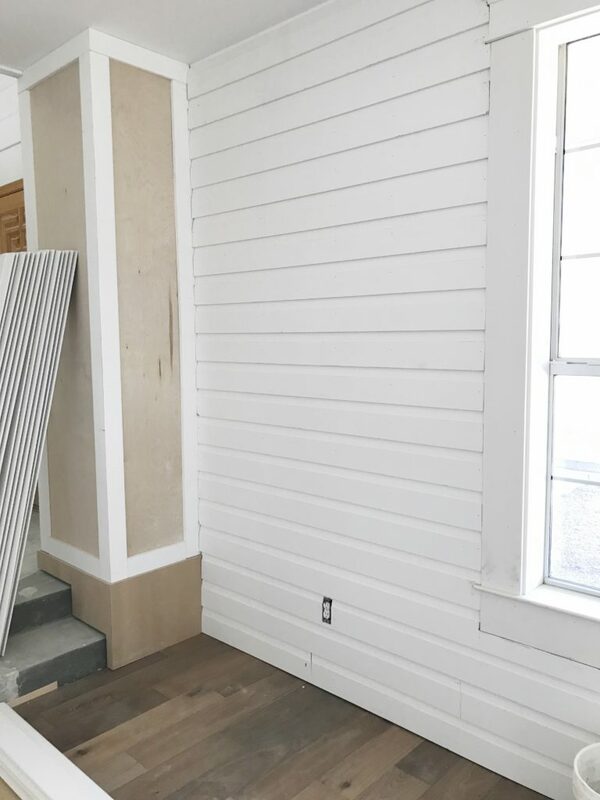 I mean, stacking baseboards on the wall is a little bit of a crazy idea but the texture is amazing. I can’t wait to see all the pretty pops of color I have popping off of this awesome background. My mouldings and doors are all from Metrie and with their whole line of products, there is no stunting your creativity! Check out the way the wood juts in and out and creates this cool texture. 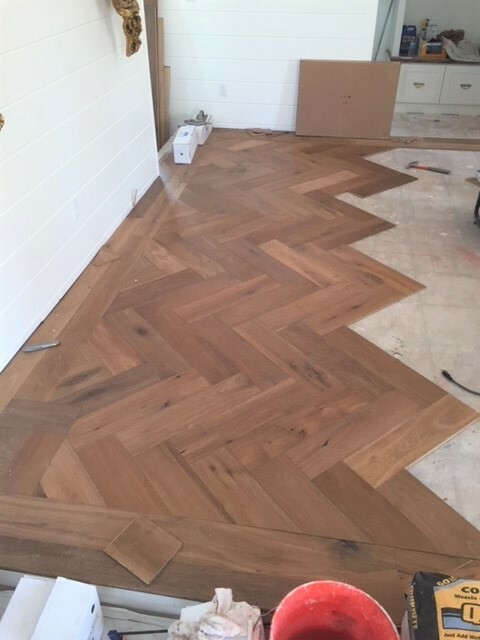 Another exciting thing that happened this week is that our wood floors went in. I feel like we are finally getting over the hump and it should be pretty much smooth sailing from now on (fingers crossed that is). We still have quite a bit of caulking, sanding, filling holes and painting to do. 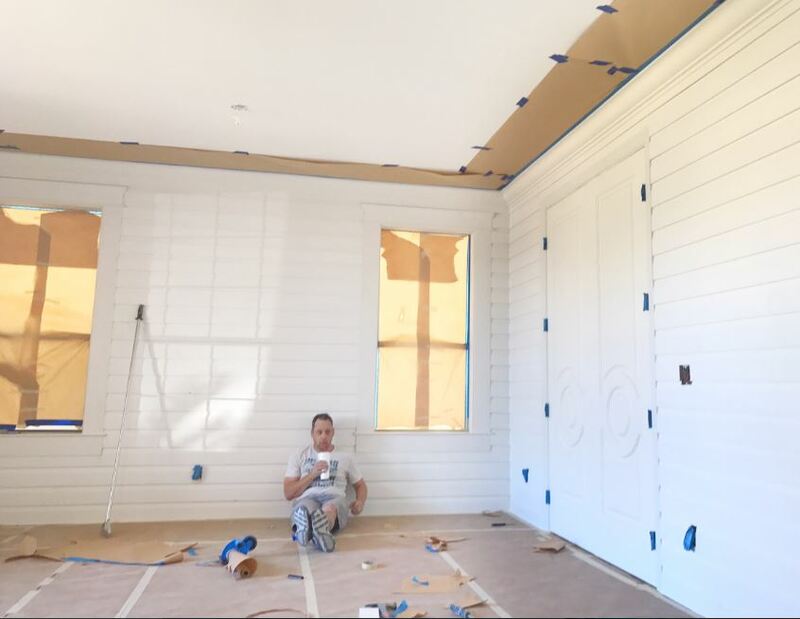 After we finish the painting, we will install the hardware on the doors and the lighting. I am so excited to install this beauty I found at Crystorama! 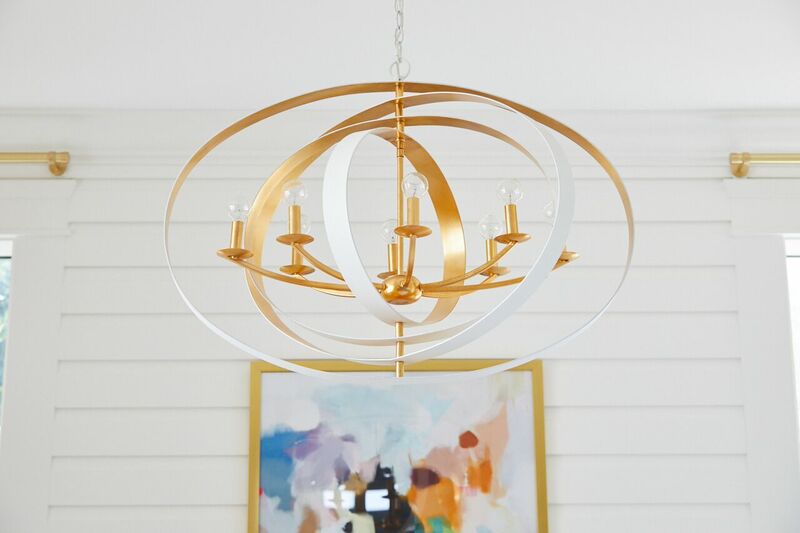 I just love the mix of the white and gold in this fixture. I feel like lighting is the jewelry to the perfect dress. It can really make or break a room. It is also important to have the correct scale when it comes to lighting. You don’t want to have a large table with a tiny chandelier. 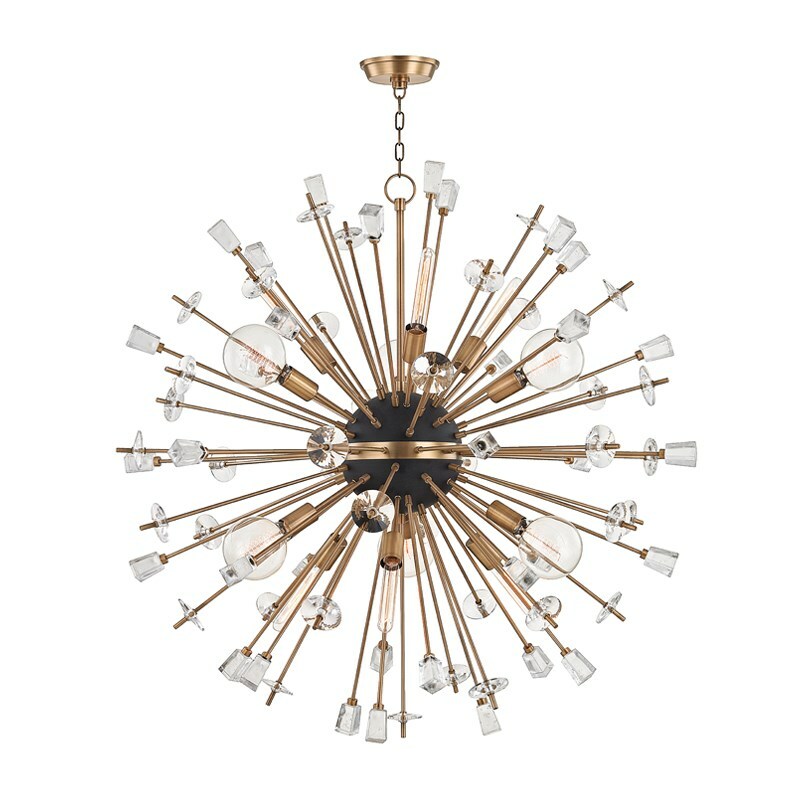 This chandelier is nice and large and will be oh so gorgeous over my new dining table! I have a few items I have been wavering on the last few weeks. I couldn’t decide how I wanted to do the drapery. 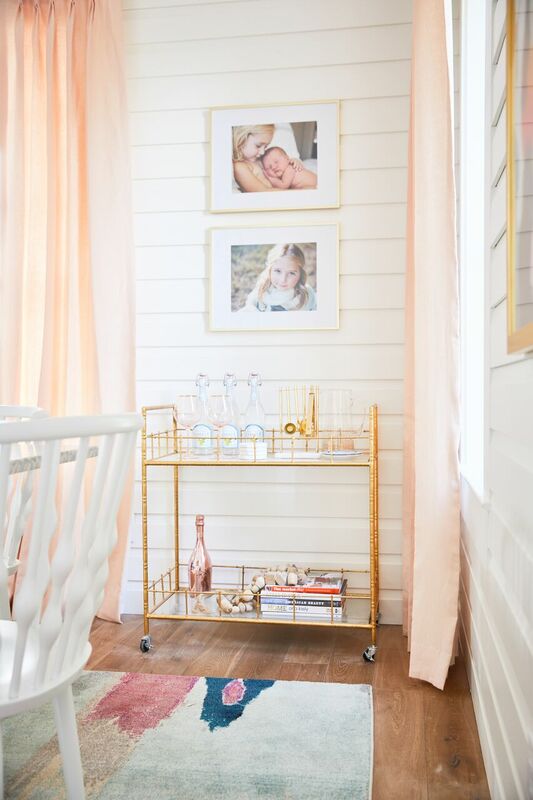 White drapery vs. blush drapery…. What is a girl to do? At first I was thinking I may just go white and have them blend into the wall and be very subtle. My heart was telling me blush pink ( I am currently obsessed) but will I tire of it? Well, life is about taking design risks right? I’m going with the blush…. I think! I found these great ones at The Shade Store, what do you think, pink or white? This room has definitely been a group effort, but none of this would be possible without my amazing husband Dave that is always down with my crazy ideas. He is going to need a nice long vacation once our remodel is done! So I leave you with this, unpainted walls and dirty floors. Two more weeks until the final reveal and I promise you it won’t disappoint. I may have even smuggled a tray I found while local shopping in Seattle home in my suitcase because it was just too perfect not to pass up for the coffee table. Until next update my friends! Follow along with all my fellow Challengers! One Room Challenge Week 3 is here! We have made so much progress so far! 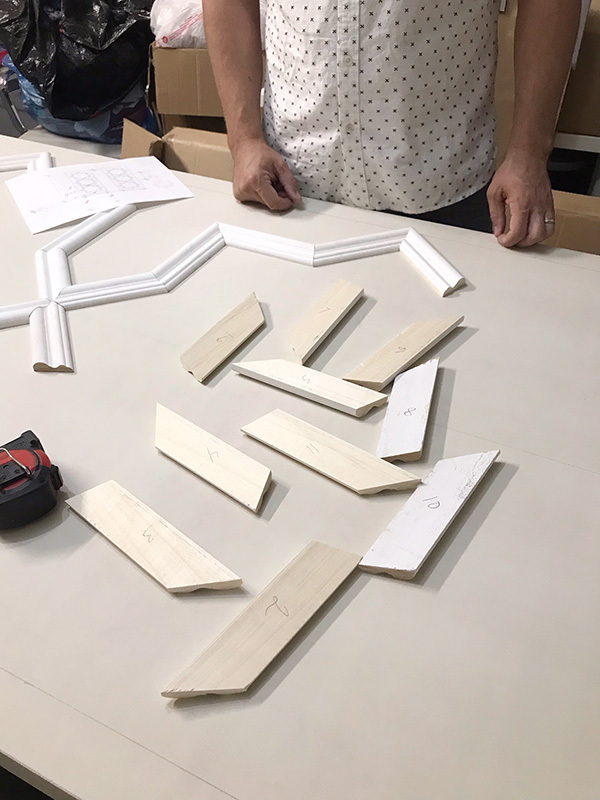 We have mostly been working on our Metrie moulding details. Our entire room is room is completely covered in wood moulding so naturally that is taking up the majority of our time. We were almost finished, and ran short on the base moulding we are using for the walls. 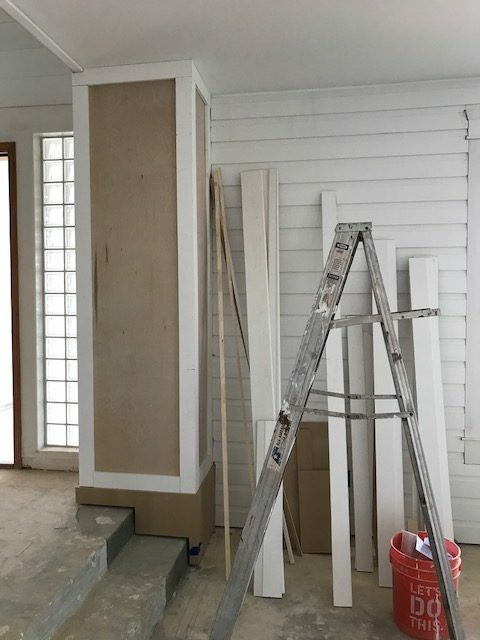 We really wanted to get all the wall moulding and window moulding up so we could fill the nail holes and get it painted. 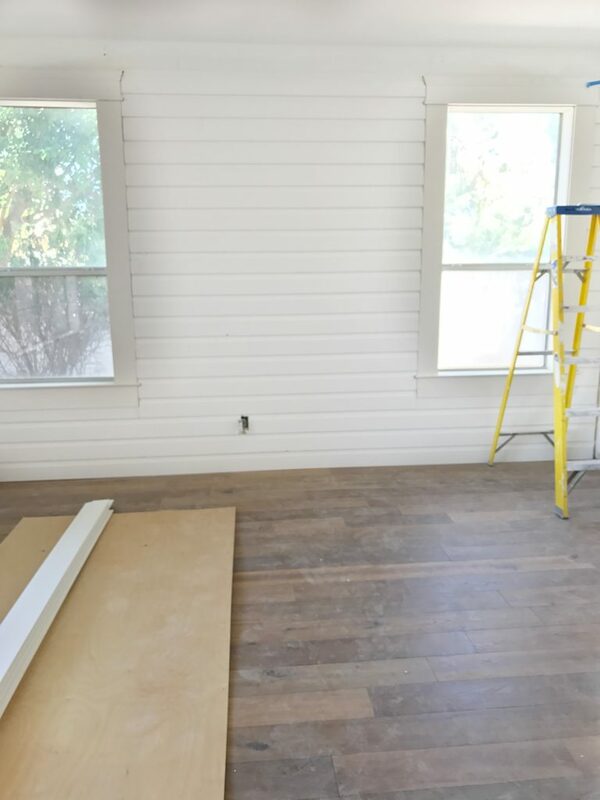 It is generally best to paint your walls before you install your flooring. We may need to go to plan B and start laying the floor this week so we can stay on track with our timeline. This just creates a little more work for ourselves since we will have to mask off the whole floor before painting the walls. Here are some more shots of the work we have completed. How cool are these walls? I mean, c’mon!!! 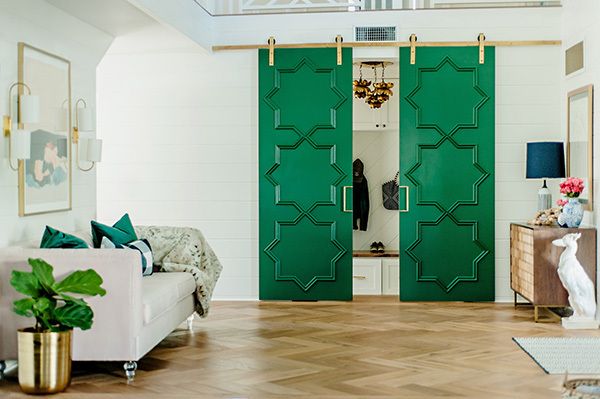 And let’s not forget about these gorgeous Metrie doors! I wanted to keep the columns simple so they wouldn’t compete with the wall detail. Yes, those glass block windows are on their way out. This isn’t the only room in the house with problems, haha! When we eliminated what was to be the formal dining room in our new house and made it into a walk in pantry and mud room, (something that was high on my list when looking for our new home) I decided to turn the formal living room into a Living Room/ Dining Room. This way, we had one room in our home dedicated to formal entertaining instead of two rooms dedicated to it. Let’s be honest here, we don’t have a whole lot of extra time to host dinner parties and sit around with our friends (uninterrupted by children) sipping on cocktails and talking about world affairs. I mean, this isn’t the 50’s. Although all those things sound great, we hardly use our current dining room or living room on a day to day basis. It is nice to have it for the holidays and the occasional dinner party. This room is one of the first ones you see when you enter our new home so it better be pretty right? Here is the space plan I came up with to accomplish that goal. This space plan is perfect to sit with friends, read a book, do some homework with the kids and family game night. Not to mention a holiday dinner a few times a year. Since the room was long, I was able to create two separate areas. I made the room feel cohesive with this very large rug I found at All Modern. When I design a room, I always love to start with what we like to call a “lead”. 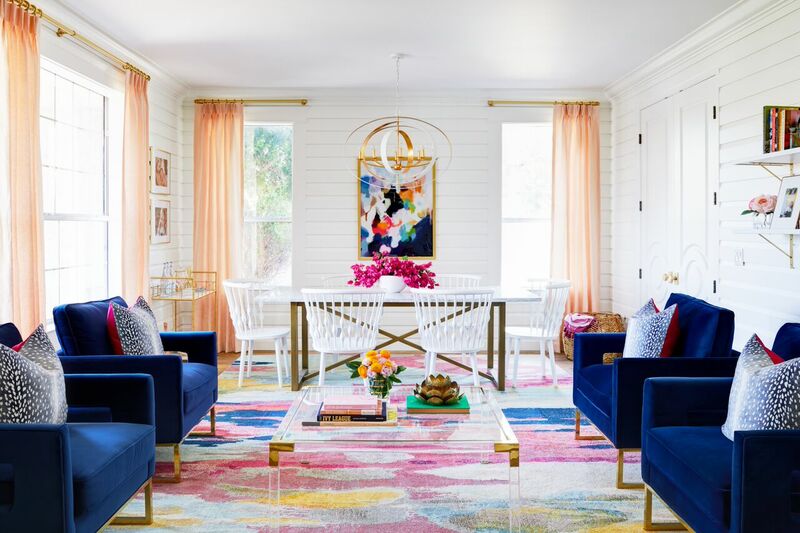 A lead fabric, painting, rug, pillow or artwork are good examples of color palettes already pulled together so you can pull several colors from them to use in your space. The rug from All Modern was the “lead” in my design because it had all the colors I wanted to incorporate in the room. It also had almost all my favorite colors so when I saw it, I knew that was exactly what I had been looking for. 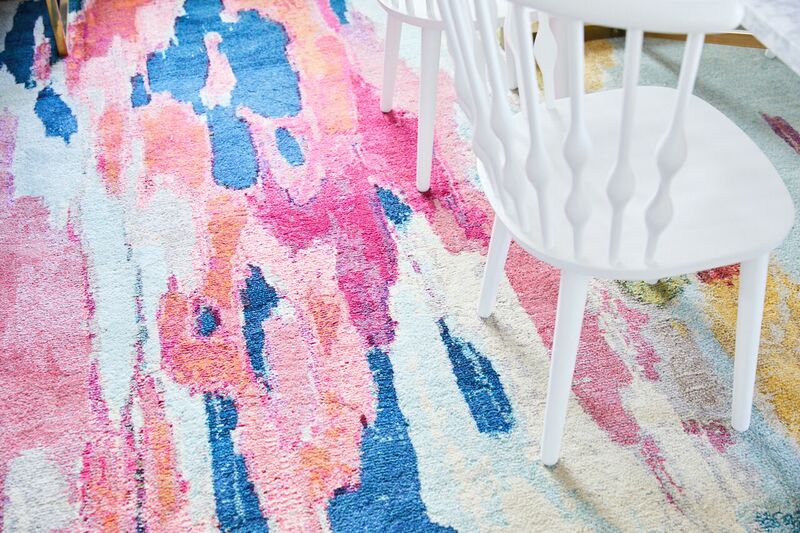 The rug comes in a very unusual size of 10′-6″ x 16′-5″ so it was perfect for my entire space. It will really make the room feel cohesive and marry both areas together although they have separate functions. I think I almost died when I received it at my doorstep, it is so gorgeous! I am also very excited about the dining table I found at ATG Stores. 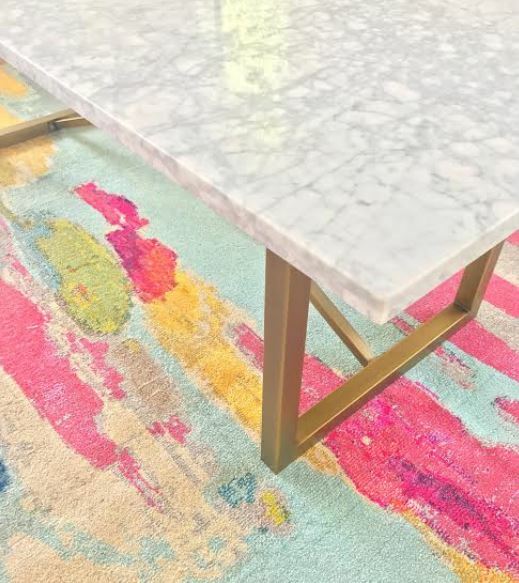 The Carrera marble top and the brass legs is the perfect addition to my room. I can see many a turkey dinner or birthday being celebrated at this very table! 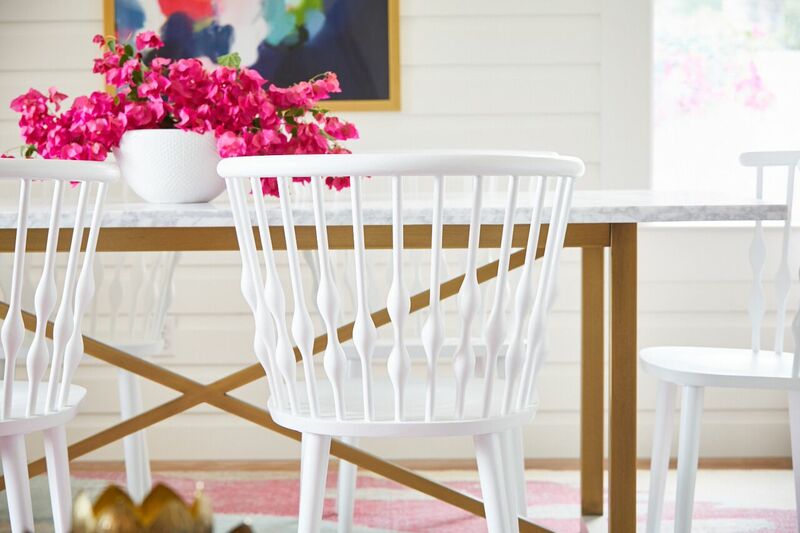 I found something a little unexpected for my dining chairs. 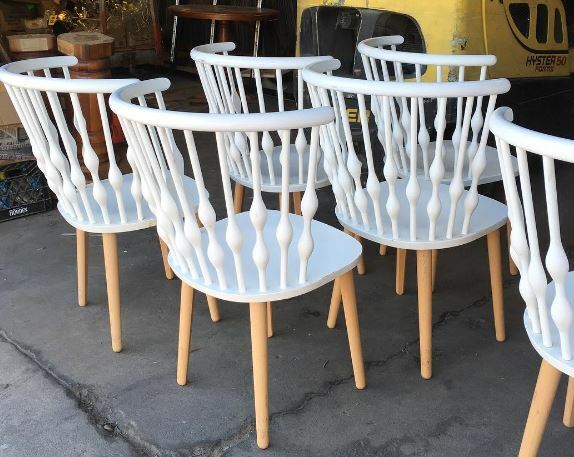 I scored a major deal on the chairs from a liquidation warehouse in Phoenix. A friend of mine saw them for sale on Facebook and I scored 6 of them. They still need a new coat of paint but they are so cool and so comfortable! Aren’t they bananas!!! I scored them for $20.00 each too!! Once we get through this week, we will get to my favorite part which is bringing in the pretty furniture. Stay tuned to see what transpires and be sure to follow along with all my uber talented fellow challengers below.